From Fortrose take a walk out to the spit of land called Chanonry point and wait for a while looking for the non existant dolphins. 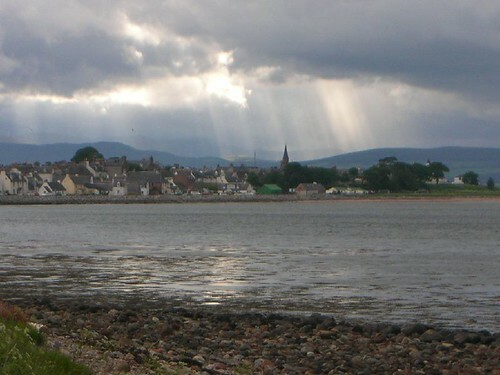 Then turn back at walk back to Rosemarkie and follow the beach till it leaves the village. There is a path that leads along the beach for a while and then it sort of peters out where the caves are marked on the OS map. There is now a fair bit of stumbling along over rocks until you reach the point at St Bernard’s well. Dont attempt to follow the shoreline at Red Nose, because the route is tidal and you will only get helicoptered out with a red face. Instead, scramble like an idiot up the steep north side of this ravine where the is a faint rough path. From here its a rough walk through bracken that can be very high in the summer. Pick up the track on the map on the east side of Gallow hill and follow that until you descend into Cromarty. Not a bad walk to start with although the day started very windy at the exposed Chanery Point. The walk however gradually got rougher and the path less distinct as the day went on. The trouble really started when the path sort of ended just by the shore just past the caves. Then it was a really rough scramble for what I thought was ages over rocks on the foreshore. the trouble with this kind of walking is that you have to be constantly vigilant where you are putting your feet because the rocks are slippery and loose. So you find that you dont get much chance to see the scenery. Some of the rock formations and the colours of the rocks made the walk worth it however. Later on things got more tricky, there was no route around the front of the cliffs and the only alternative was to scramble up a gorge onto the headland above. There was a faint path at the top which got fainter as we went along until eventually I was trying to get through a “path” which had bracken and gorse at head level. It wasnt until we actually reached a signpost in the middle of this vegetation that we realised that this was meant to be an actual route. Obviously not a route that the council could be bothered keeping open however which was a shame because the walk would be a good one. At the side of Gallow Hill there is a path around the hill leading down to Cromarty. Once you negotiate the cow herd, the path down into Cromarty is a good one with lovely views of North Sutor. Luckily I found a special “cow chasing stick” which meant that I was protected from any cows that wanted to attack me and gore me to death. This entry was posted on Wednesday, June 21st, 2006 at 11:59 pm and is filed under Scotland, trail, Travel, trek, walk. You can follow any responses to this entry through the RSS 2.0 feed. You can leave a response, or trackback from your own site.